From recent article (August 20, 2018) in the Mountain Scene – read the original on their website here! A new children’s book allows readers to personalise its characters – and help local community groups fundraise. 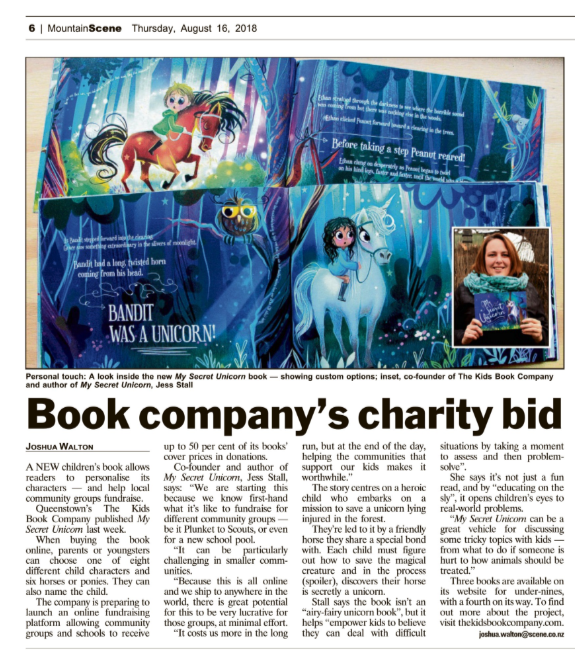 Queenstown’s The Kids Book Company published My Secret Unicorn last week. When buying the book online, parents or youngsters can choose one of eight different child characters and six horses or ponies. They can also name the child. The company is preparing to launch an online fundraising platform allowing community groups and schools to receive up to 50 per cent of its books’ cover prices in donations. Co-founder and author of My Secret Unicorn, Jess Stall, says: “We are starting this because we know first-hand what it’s like to fundraise for different community groups – be it Plunket to Scouts, or even for a new school pool. “It can be particularly challenging in smaller comm-unities. “Because this is all online and we ship to anywhere in the world, there is great potential for this to be very lucrative for those groups, at minimal effort. The story centres on a heroic child who embarks on a mission to save a unicorn lying injured in the forest. They’re led to it by a friendly horse they share a special bond with. Each child must figure out how to save the magical creature and in the process (spoiler), discovers their horse is secretly a unicorn. Stall says the book isn’t an “airy-fairy unicorn book”, but it helps “empower kids to believe they can deal with difficult situations by taking a moment to assess and then problem-solve”. She says it’s not just a fun read, and by “educating on the sly”, it opens children’s eyes to real-world problems. Three books are available on its website for under-nines, with a fourth on its way. To find out more about the project, visit thekidsbookcompany.com.